An Amazonian tribe has sent an urgent appeal to shareholders of Canadian-Colombian oil giant Pacific Rubiales to protect the lives of uncontacted Indians in Peru, whose survival is threatened by the company’s work on their land. Watch the full video appeal. The Matsés and Survival International have sent the message to hundreds of shareholders – including Citigroup, JP Morgan, General Electric, Blackrock, HSBC, Allianz, Santander and Legal and General – urging them to divest from Pacific Rubiales. The company has already started exploring for oil in ‘block 135’, despite it lying directly over an area proposed as an uncontacted tribes’ reserve, and is planning further explorations on Matsés territory. The Matsés report that helicopters are flying over the area, and the $36 million project will see hundreds of seismic lines cut through the rainforest used by the Indians to hunt and gather. 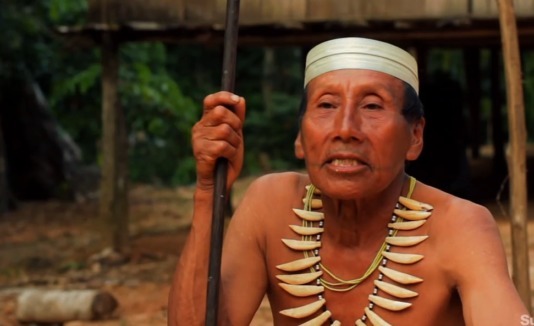 The Matsés are very concerned about the safety of the uncontacted tribes living around ‘block 135’ and have called for the area to be protected. Both the uncontacted Indians and oil company workers are at extreme risk if the work continues – the Indians are vulnerable to common outside diseases to which they have no immunity, and the workers are liable to be attacked by the Indians, who will see them as invaders of their territory.